1st year Revenues @ $234 Million. 2. PocketPlus USA National Launch is in 4-5 Months. a. $50,000 a month for National Accounts. c. Immediate 50% Profitability - 25-50% monthly growth. C. 3-4 Months > Launch StreetTalk – Join the Conversation. one, implement it and then develop more capability over time. b. MarketSocial Communities– CitiMart w/CityStores support MoniCoins. f. Print – Qtrly 8 Community Guides w/MarketSocials. PocketPlus will already be distributed in 108 Cities. Dining, Home, Healthcare, Investing, Services, Charity, Acts of Faith and Politics. Note: We are at an advantage. The MarketSocial provide us an immediate revenue and market presence across 108 Cities and 10 Market Sectors. We are also aided by our 5-in-1 Media Advantage Formula which includes SmartMoni. We launch with the top national chains in USA - Retail, Restaurants & Service Chains. 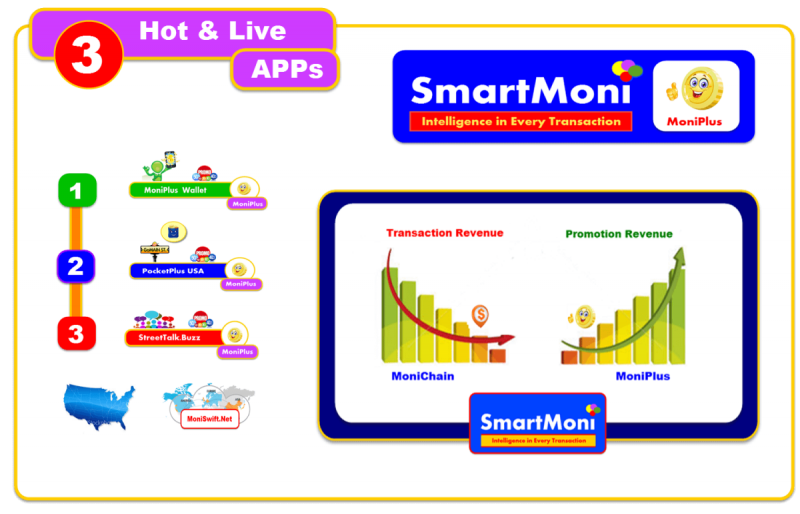 This allows us to introduce SmartMoni to each one and introduce our fee structure for MoniCoins, MoniPlus and Smart Contracts.